Beneath the streets of New York City live the Avicen, an ancient race of people with feathers for hair and magic running through their veins. Age old enchantments keep them hidden from humans. All but one. Echo is a runaway pickpocket who survives by selling stolen treasures on the black market, and the Avicen are the only family she's ever known. Echo is clever and daring, and at times she can be brash, but above all else she's fiercely loyal. So when a centuries old war crests on the borders of her home, she decides it's time to act. It's been ten years since The Ala found the orphaned Echo living in the library, the young girl forced from a home that neither seemingly wanted or cared for her. Ala is an Avicen, living underneath the city with plumage for hair and a race living under the threat of violence in a centuries old war. The Avicen are the only family that Echo has ever known, but not all within the magical community welcome a human into the fray. So Echo still chooses to live within the library walls, hoarding words like treasures and making a living from picking pockets. But when she steals a music box for Ala's birthday, they seem to have uncovered a centuries old fable that paints a mythical Firebird as a means to end the tension between the Avicen and Drakharin, or dragons. Caius is The Dragon Prince, a leader among his kingdom and on the verge of conflict with the Avicen. He's heard the rumours about the human girl working with the Avicen. He needs to find the Firebird before it falls into enemy hands, it may be their only chance at finding peace for his kingdom. But within the Drakharin ranks, a coup is forming. His blood thirsty sister planning to take over the kingdom and send their soldiers to war. Both Echo and Caius want a peaceful resolution, and it isn't long before the two cross paths on their search for the Firebird. Together, they are now on the run from both the Avicen and Drakharin, avoiding capture while following a series of clues to find the once mythical entity. The Firebird is within grasp. Tensions will erupt, alliances will shatter and neither will be prepared for the aftermath. The Girl at Midnight was absolutely stunning. The magical prose was delicious and completely captured my attention from the very first page. Beautifully written, it's comparable to the fantasy of Daughter of Smoke and Bone, the sassy nature of The Mortal Instruments series, and the slow burning romance of Throne of Glass. Imaginative and taking on a whimsical quality, it follows the story of Echo and Caius respectively, along with their counterparts in best friend Ivy and Caius's royal guard in Dorian who are all searching for the mysterious Firebird. Some more reluctantly than others. I simply loved it. The most striking aspect of The Girl at Midnight was the quality of writing, especially being a debut novel. It was absolutely immaculate. I loved the lyrical prose, it gave the magical storyline a romantic and whimsical flair. The distant sound of a birdsong gave way to the gentle chirping of crickets in the dark and the lonely hoot of an owl in the distance. A chill was beginning to set in. It was late spring, but remnants of winter clung to the forest like a lover reluctant to say goodbye. It made my heart ache with it's beauty. Where flowers bloom, you'll find your way, through the darkness and the flames, but beware the price that you must pay, for only the worthy will know my name. The Girl at Midnight is absolutely glorious. A mixture of adventure, fantasy and the whimsical. 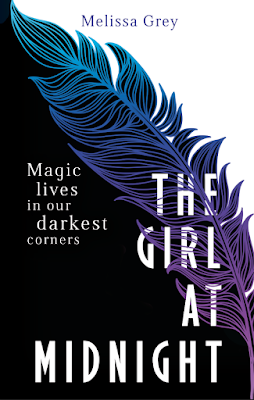 Not often does a book leave you completely spellbound, but Melissa Grey and her debut is a force to be reckoned with. Book two can't come soon enough. Thanks Eugenia. Honestly, it was absolutely beautiful. You know those books that are just so incredibly lovely that you can't help but fall in love with? This was it. As soon as one of the characters was described as having plumage, I was hooked. The moment that you compared its likeness to DoSaB, ToG and TMI, I know I'm going to need to read this ASAP. You need to preorder or ask your library to get a copy of this one in Abby. It was so incredibly beautiful and reminiscent of Daughter of Smoke and Bone. Probably the closest we'll see. I can't wait to see what you think of it once it's released. And lovely to see you back blogging poppet. Me either Frannie. My goodness, how utterly gorgeous was it! A whole year is going to be torturous isn't it. How will we survive! OMG DID YOU JUST COMPARE THIS TO DAUGHTER OF SMOKE AND BONE? Sign me up for this book, goshdarnit.I need to read it now. I need to read it yesterday. I AM ALREADY PARTIALLY IN LOVE. I did. I totally did. When publishers make comparisons in the synopsis and compare books to other popular books, usually they're so far from the mark. But with this one they've been spot on. I can't even begin to tell you how incredible it was. You really need to read it for yourself. So you've pretty much just compared this to some of my favourite books. Which means that I NEED THIS ASAP. And gah, those quotes are beautiful! I want, I want, I want! The whole book is lyrical Kara, I was in heaven! I was completely smitten. And it's a debut novel, can you believe it, A DEBUT! Be still my beating heart. I can't guarantee that I'll be reading this one again, and again and again. It was beautiful! Fantastic review, Kelly! I'm so glad you love this one. I loved it too and am dying for book two. I love it when you are sure you'll like a book but then it turns out to be amazing and you fall in love with it. Thanks Rochelle. I fell head over heels for this one, just so incredibly beautiful. I hope book two follows along the same prose and more plumage! I love the diversity of it's romances too, it felt very Throne of Glass in that respect. It's glorious and so beautiful that it made my heart ache Mishma. You'll absolutely adore it. I can't wait until you grab a copy, would love to see your thoughts. Finally a positive review for this book! Many of the reviews I read online were either bad or just lukewarm. I adore that you compared this to Laini Taylor's books because I just loved the writing and the atmosphere of that one - so otherwordly that it's surreal at the same time. I will have to get this one as soon as possible. I haven't seen many reviews for this one Faye, but I can imagine most might stem from being somewhat protective of the Laini Taylor series that it might cloud their judgement. I like Daughter of Smoke and Bone, but I LOVED The Girl at Midnight. For me, it was a simpler format and had the same intensity as Throne of Glass as well. I should add that it was the same type of humour, but without the annoying characters that go along with it. It's just lovely Aimee and I can't wait to see what you think of it. Oh my goodness Kelly, I am so ready to read this! I've heard amazing things about this book, especially about how beautiful the writing is, so come April 28th, it WILL be mine lol. YES! You need this book in your life Martika, it's just so beautiful! Oh wow. This book sounds gorgeous! And what a world you've described. Everything you've said makes this book all the more irresistible. Beautiful review, Kelly! It truly was Joy. It had this beautiful whimsical quality to the storyline too. Echo was such a strong, independent character, I loved her and her quick wit and sass. I just adore that lyrical style of writing. Starting this one tomorrow and your review has me SO excited! I cant wait to dive in! Ohhh Alyssa, I can't wait to see your thoughts on it an hope you enjoy it as much as I did. My goodness, I can't even begin to describe how much I loved it. Me too Claudia and what makes The Girl at Midnight even more phenomenal is that it's a debut novel as well. That blows me away. It was absolutely gorgeous and we're going to see big things from Melissa Grey is this one is anything to go by. I don't usually either Bec, but since reading Red Queen, I've been getting into the milder fantasy novels and this one isn't overwhelming and reads as an urban fantasy really. You should definitely give it a try, it might really surprise you. It's worth it just for the lyrical style of writing. I found them pretty similar in prose too Joy, both so incredibly beautiful, but found The Girl at Midnight slightly more intense and action packed. So glad you're enjoying it and can't wait to see what you think of it. I love the difference in the American and the Australian cover. Personally, they are both stunning. I can't wait to read this and am glad to hear it has a romance element to it.Itching to buy my own copy! The romance is one of those dangerously intense and forbidden romance types. Really delicious. I love the Australian cover even more so, it's so incredibly eye catching isn't it. Can't wait to see what you think of it Sarah! I honesty can't praise this one enough. It's pretty mild and mainstream fantasy, which is perfect for me being a non high fantasy reader but so incredibly lyrical. My goodness Zoe, I can't wait to see what you think of it. It's simply beautiful Yani. I can't wait for you to grab a copy and dive in. I feel like rereading it again already. If you're headed for a reading slump Benish, this will no doubt pick you out of that funk. As soon as it mentioned feathers for hair, it was game over for me and I fell in love with the world Melissa Grey created. Just so beautiful. You need to pick it back up poppet, stat! I've seen so many reviews for this today, and it's generally compared to City of Bones and DOSAB. Am I excited? HELL YES. I just got approved for it on Netgalley, even though I requested it months ago, and I can't wait to get some books out of the way so I can get to it. YES! It was glorious Shannelle! Absolute perfection. I even went back and read Daughter of Smoke and Bone just to maintain that book high. As Taylor Swift would say, haters gonna hate Paula, but I for one absolutely loved it. I can see why some readers might not warm to the concept, especially avid fans of The Daughter of Smoke and Bone series. But I love both books and loved this one just as much. The intensity reminded me more of the Throne of Glass series, along with the forbidden love aspect. You know, whenever I read something so lyrically beautiful I automatically can't wait to see what Jess thinks of it. We both love that lyrical prose and this delivered it on spades. SPADES I tell you. I need book two now. I don't want to wait, it may very well kill me. I've heard this book was very good!! I love sassy characters they always make things fun! I love great/lyrical writing in books. I think its so unique. I can't wait to finally read this! Great review. Thanks Taylor. It's just beautiful, and the intensity and lyrical prose was brilliant. Looking forward to seeing what you think of it too. Ohgoodness, I'm kind of overwhelmed to read this after reading your review, lol. But I love lyrical writing styles and it's rare for an author to pull it off. Sometimes it may seem too gimmicky, but some can be just absolutely fantastic. Wonderful review!!! Sounds like a really beautiful stunning book, with fantastic magical writing! I'm looking forward to this one, especially it being compared to DOSAB. It is Jeann, truly. So lovely and magical and just made my heart flutter with how utterly stunning the prose was. I can't wait to see your thoughts on it.